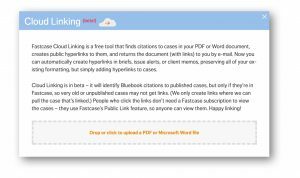 Today we’re introducing Cloud Linking, an automated hyperlinking tool from Fastcase. 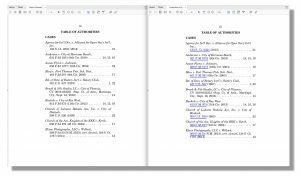 Cloud Linking automatically finds citations to judicial opinions in your PDF or Microsoft Word documents and instantly creates hyperlinks in your document to original sources, without affecting the document’s formatting. With Cloud Linking, you can write a pleading for a court, then automatically create hyperlinks to caselaw citations before submitting it. You can use Cloud Linking to create hyperlinks in an opposing party’s brief, allowing your team quickly to pull the cases cited. Or, for a client alert, your firm can write an article with citations in it, automatically create hyperlinks with Cloud Linking, then paste the linked text into an e-mail newsletter or blog post. Did we mention that Cloud Linking is completely free for Fastcase subscribers? Fastcase Cloud Linking currently works only on full citations to caselaw within the Fastcase scope of coverage, which for most jurisdictions goes back to the late 1800s (we can’t add links to ancient cases not yet in Fastcase!). We plan to add links to statutes and other library types in future releases. Because Cloud Linking is based on Bluebook citations, the service won’t work with unreported cases, stub cites, cases with embarrassingly bad Bluebook citations, or cases so new that they haven’t yet been printed in reporters with citations. For the most part, though, Fastcase Cloud Linking works just like magic. Simply load up a Word or PDF document with caselaw citations and Cloud Linking will find them, link all your citations to a public version of the case, and return the document to you in the same format. Fastcase Cloud Linking is live in beta, free for all Fastcase subscribers, on both Fastcase Classic and Fastcase 7.